The East Cape of South Africa has been a premiere safari destination for many years. A primary reason for that is the area has 5 of Africa’s 7 known biomes ( bio-geographic regions) –all in this one province! That means a tremendous habitat diversity, which translates into highly varied geography and plant life, and a huge variety of animals and birds. This Professional Hunter, besides his own ground– hunts 80 other concessions totaling hundreds of thousands of acres, virtually guaranteeing that you will find every specie of plains game your heart desires! In addition the area has much scenic beauty and many parks and other things to see and enjoy. It is a wonderful safari destination. So you have a great area, a great diversity of game and terrain—and we have secured you some incredible pricing on top of that!! The list of species is awesome! Be sure to look at the free animals we have negotiated on your behalf! They are added at no charge onto your package! The more animals in the package, the more free animals you get!! You will stay at this safari-style Guest Lodge. The Lodge is situated on a private game reserve which boasts over 17 species of wild game animals roaming around the lodge, including Kudu, Giraffe, Impala, Nyala, Bushbuck, Waterbuck, Duiker, Grysbuck, Springbuck, Warthog, Bush pig, Mongoose, Jackal, Meerkat, Lynx and primates. Sip cocktails at the evening fire while watching a giraffe across the valley or for the other local critters to show up! We took great enjoyment over watching the giraffes across the valley- looking like pre-historic dinosaurs, towering over the trees! We’ll drink to that anytime! Great people and PH’s too! Spoil yourself in the Jacuzzi while sipping on South African champagne and fine wines. The view from the deck around the Jacuzzi is out of this world. WE were there in June (their winter) and it was too cool for the Jacuzzi!) You can expect to spot wild antelope from all around the Lodge area.. You can not beat this experience. 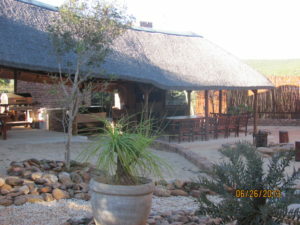 The Lodge has 5 double en-suite rooms which sleep two per room. Two more bigger rooms are nearly finished. Each room is tastefully furnished in a safari style, with high quality linen and furniture to give you an African feel, with all the luxuries expected of a 4 star establishment including your own TV. All the rooms are fitted with a well stocked mini bar / fridge with local South African beverage including water, pop and beer. Each unit is serviced daily and your laundry is done daily. Getting here is very simple. You simply fly to Port Elizabeth, (normally via Johannesburg) and the PH will meet you and pick you up in PE! About a 45 minute drive to the Lodge. No pick up charge either! AND- if you bring along an observer, they will be allowed to take one animal free of charge! The observer’s animal is selected by the PH, of course. Now how about we also throw in daily free laundry service? So only bring two sets of clothing- that is all you need! With today’s excess luggage prices, that is important. He gun hunts many tens of thousands of acres, but he ALSO does many bow hunts. He now has 6 bow hunting areas of 38,000 acres– where he allows ONLY bow hunting. 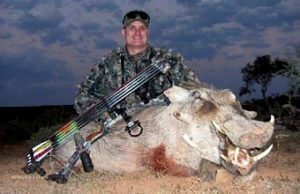 They had about 91 bow hunting clients in 2007— taking 411 animals!! That is a great average of nearly 5 animals per hunter!! They have pit blinds at waterholes and their vegetation is excellent for walk & stalk hunts. Either blind or walking will work. Tree stands because of the vegetation are not used. This outfit knows bow hunting!!! And of course they handle just as many rifle hunters, if not more! “This adventure was first class from the time we arrived in Port Elizabeth until we were dropped off to begin our journey home. Our Professional Hunters met us at the airport and took us to the lodge we would call home for the next 18 days. There were three of us hunting and each hunter had an observer. Each hunter was successful the first day. This success continued during the duration of the hunt. Our group got 27 very nice trophies. These trophies included Waterbuck, Nyala, Kudu, Gemsbok, Blue Wildebeest, Eland, Blesbuck and many, many more. 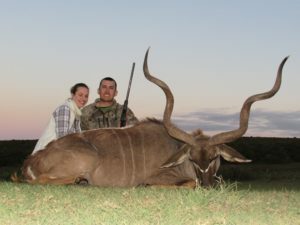 My two friend’s wives even got into the act, taking a very nice Kudu and White Blesbuck. My White Blesbuck green measured very high in SCI. Hello Butch ! I wanted to send along a word of thanks for arranging this safari with Hunt # 6 and staff! He runs a very good operation, and his staff and my PH were some of the best I have seen. The food is absolutely world class and his lodge was fantastic. Mario, my PH, was among the top guides I have had the pleasure to hunt with, and will remain a friend for a long time! Please find some pictures of some of the animals I was able to harvest with my rifle. 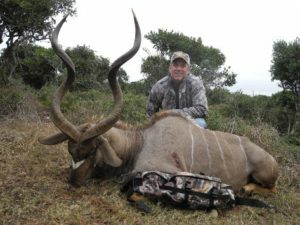 Note: My Kudu (51″), Gemsbok (41″), and Blesbuck (17 1/8 “) will make Roland Ward Awards Book. All the packages shown include all your lodging; all meals; your DAILY laundry service; your PH and his support team of trackers and skinners; field preparation of all trophies; and round trip pickup and return from Port Elizabeth Airport (also usually an extra!!). Those two items alone save your probably $500 to $900!! You do pay for dipping, packing and shipping, for gratuities and for your alcoholic beverages. There is a delivery charge of about $80 to get your trophies to the taxidermist he suggests. We ca explain the trophy import process to you and advise you on what you need to do – as we have done it many times. Hunting usually starts with an early breakfast (usually light) and then into the safari vehicles. You will drive in the vehicles spotting for game or tracks. You will get out to glass and do stalks. Or you may walk and stalk if that is a preference- but most success comes from using the vehicles to cover lots of ground. You are led on a stalk by a tracker and a PH- so you are normally 3rd in line. Practice shooting standing off of sticks– very important! Most shots are done that way. Lunch can be a major or minor affair, then hunt all day and a big dinner late, usually around the fire (lapa). Stories flow around the campfire! He has a fully stocked bar and evenings ended up by the fire with a drink in hand. Great stories and lies were told!! 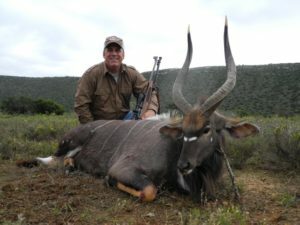 2018 PRICING: Packages include trophy fees, all daily rates, all government taxes (Vat), accommodation, daily laundry service, food, beverages, transport to and from Port Elizabeth Airport, vehicle for transport in hunting areas, services of licensed professional hunter, trackers, skinners and field preparation of trophies. Observers $120/day.NOTICE: Alcoholic beverages are not included! We can arrange for liquor, but you must tell us. Transport of raw trophies/skins to our taxidermist ($120 per client, per safari). Alcoholic beverages and soft drinks from the bar. Gratuities – The norm is 10% of your package price. NOTICE: The policy here is if you don’t see the animal or you don’t shoot one — then you don’t pay for it and you will be credited back the “package value” for the animal. His PH’s are good and will always tell you beforehand the size of the animal. Package value is always discounted, so do not apply the full trophy fee- usually about 70 to 80% of the trophy fee is the Package value. VALUE ADDED TAX (VAT) –PLEASE NOTE THIS OPERATION INCLUDES THE VAT TAX IN THEIR PRICING- MANY CHARGE MORE THEN THIS OPERATION, — AND THEN ADD THE VAT TO BOOT! Cancellation: Less than 6 months before arrival date – no refunds will be made, unless re-booked for any period within the next twelve months. More than 6 months before arrival date – 50% of the deposit will be refunded. Balance of hunting package payable on arrival. All payments must be made in either cash, traveler’s cheques. NO MONEY ORDERS please. He does have credit card facilities and accepts all VISA & MasterCard’s. No debit cards please. NOTE: He charges a 6% surcharge to use this convenience- gets expensive!. Check with your bank if the card can be used outside the USA and check your limit on the card that you have sufficient funds available. Trophy fees are payable in respect of all extra animals bagged or wounded. You can review the trophy fee list. All quotations issued are valid for 3 months from date of issue due to fluctuation in exchange rates. “Howdy Butch, I just returned from my wonderful hunting trip to Africa and couldn’t wait to tell You about it. 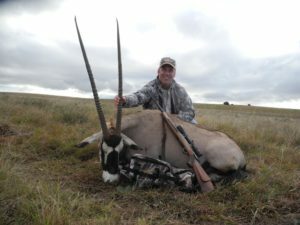 You will recall that You and I spoke about 9 months ago about booking a hunt in Africa. I was trying to decide between a couple of outfitters including this operation. I finally decided that this operation was the way to go and booked it. The Lodge is first class and very impressive. The meals were absolutely wonderful. 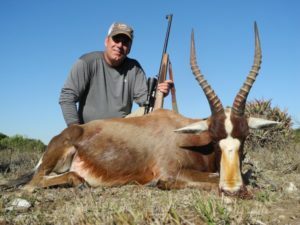 The hunting was on very large tracts of land and there were plentiful trophies to choose from for each type of animal I was hunting (Kudu, Gemsbuck, bushbuck, impala, and springbuck). The landscape was beautiful. The Professional Hunter was both personable as well as very knowledgeable and helpful concerning animals, trophy size, hunting methods etc. and I was successful in bagging wonderful trophies of each type of animal hunted with his help. The owner and his wife treated me like gold and made me feel comfortable, accepted and pampered. These are wonderful people who are running a first class operation in all respects. I can recommend them to You and Your clients without any hesitation whatsoever. I could not have asked for a better experience. If any of your clients want to talk to someone who has hunted with this operation feel free to have them e-mail or call me. Thank you. Warm regards, Ray Harding”. Clients: GUN TRANSPORT: NOTE BELOW – IF TAKING YOUR OWN WEAPON YOU MUST ACQUIRE PERMITS!! Butch and staff will help you arrange for gun permits and processing assistance. The gun import process is best handled by one of several services who do that- costs average around $100-$120. Must be arranged for well in advance! Ammunition must be separated from weapons and may be packed within checked luggage, but not in the rifle case! Ammo must be properly secured in an ammunition case or solid box with a lock on it. No ammunition may be packed loosely in checked baggage or within the same case as firearms. All luggage, domestic and international, is now being screened in South African airports. Screeners are finding ammunition in checked bags that is incorrectly packed and are forcing passengers to remove it from their bags, which is causing all kinds of havoc. All ammunition must now be packed and transported in a lockable ammo box placed within your checked luggage (NOT the rifle case!). A manufacturer’s carton is no longer sufficient. Remember that there is also a limit of five kilograms of ammo per passenger. That includes the weight of your ammo box. And don’t forget to declare your ammo at check-in. We strongly recommend that ammunition be packed in lockable cases, which can be handed in as loose items at the firearm counters to avoid possible delays during checked baggage screening. The day trips are including all meals, personal guide, vehicle and all entrance fees at venues. 1 day Elephant RIDE safari where they will ride elephants and interact with them like feeding them after the ride. This is a fantastic trip. All the clients enjoy this the most. $190 per person . 1 day safari to a Lion reserve which include a night drive looking at 35 species of animals and Lions hunting & feeding. This is a must do. $150 per person. 1 day Safari to the cheetah ranch where they can touch wild Cheetahs and handle baby Cheetah cubs and Lion cubs. This is a must for the kids. $70 per person. 1 day tree Top Tour. Enjoy the unequalled experience of traveling 30 meters above the forest floor through the tree top forest canopy gliding along on a steel cable. A view once only seen by the many exotic birds of the indigenous forest. At each platform spend a few minutes relaxing as your guide enthusiastically explains the ecology of the forest around you. Pointing out magnificent giant ferns and the many different exotic trees. About three hours later you emerge from the forest having undertaken a rare journey of a life time. An unusual experience which will never be forgotten! $150 per person. 1 day Bungee jumping – Bloukranz Bridge is in the Guinness Book of Records as the highest bungi jump in the world at 216 meters. Even if it is not for you, it is well worth holding your breath and watching others take the plunge! The free fall takes 5 seconds, the stretching of the bungi rope takes another 2 seconds. The first rebound is higher than the Victoria Falls Bridge jump and the second rebound is higher then the Gouritz Bridge, which is 65 meters. Your body accelerates to around 120mph before decelerating – Awesome stuff!! – Day trip $190 per person. Other trips and choices can be added. We can repeat one of the above for mom and dad if they want. These trips include personal guide, air-conditioned vehicle, all entrance fees at venues we visit and drinks for the road. Trips do not include lunches at restaurants if clients wants to eat at steak ranches or restaurants. 1 day scenic tour down the garden route going as far as Knysna. For the family $190. This trip we can combine with a visit to Oudtshoorn where we can visit the biggest Ostrich farm or the world renowned Kango caves. For the family $198. Rifle Hire: $30 per rifle per day, and $4 per cartridge. WE KNOW AFRICA- JUST ASK! !